The clade Lycopsida, of which the living lycopsids are members, also diverged in the Early Devonian. 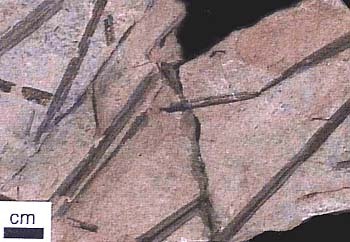 The Rhynie Chert plant, Asteroxylon is a member of this clade. 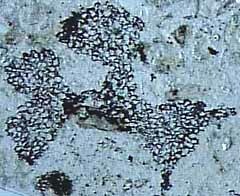 Asteroxylon (Figure 5.3c) (VG 1:12) is characterized by a lobed protostele, lateral, reniform, stalked sporangia, and an axis covered with enations (Figure 5.3c), multicellular flaps of tissue that emerge from the plant epidermis. In Asteroxylon, enations are not vascularized, however, a small extension of the vascular cylinder extends to the base of each enation. It is impossible to say how, or whether, this arrangement might have functioned. Instead, the change in vascular tissue differentiation that led to the enation-ward vascular strand may be related to the development of the enation itself, with a functional role for enation vasculature following later. Whatever its origin, the vascular trace in Asteroxylon is a tempting intermediate in the evolution of true leaves in the lycopsid clade. 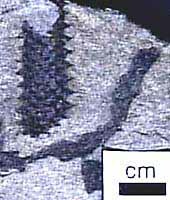 True leaves-microphylls-are observed in Baragwanathia and also in Drepanophycus (Figure 5.5) of the Early Devonian of the Northern Hemisphere. 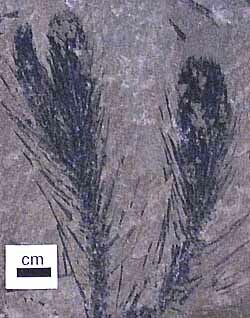 Drepanophycus (VG 1:13), like Baragwanathia, has leaves vascularized by a single, unbranched strand. Stalked, reniform sporangia reside clearly in the axis of the leaves. Axes may be several cm. in diameter and branch irregularly. Leaves of Drepanophycus arise in a more or less spiral phyllotaxy, but the pattern of leaf arrangement is variable and may appear almost whorled at some points along the axis. Variability in appendage arrangement is characteristic of early members of several different clades and may be a clue to the evolution of developmental regulatory mechanisms early in the history of clades. Figure 5.5: Drepanophycus (A) whole plant reconstruction, (B) transverse section of lobed stele. 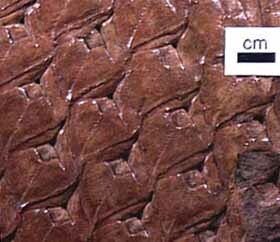 Along with Drepanophycus, a variety of other herbaceous lycopsids flourished from the Early Devonian into the Pennsylvanian. 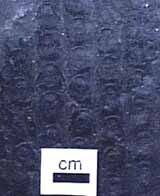 Archaeosigillaria (VG 1:14) has dichotomizing axes that were up to 5 cm in diameter. 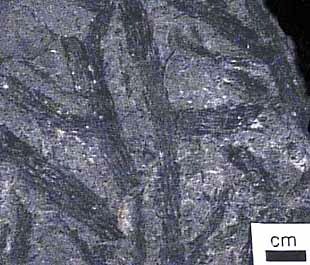 Microphylls are spirally arranged and have ligules, which unites these groups with living Isoetes and Selaginella, along with the tree lycopsids of the Pennsylvanian. 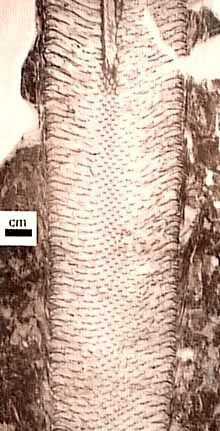 Archaeosigillaria had an exarch actinostele with scalariform and reticulate tracheids. Sporangia were born adaxially on unmodified leaves. Leclercqia has microphylls that branched at their tips (Figure 5.6, Figure 5.3d) (VG 1:15), which violates the technical definition of microphyll. 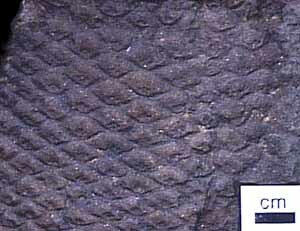 However, the branched vascular strand is clearly derived in this group. 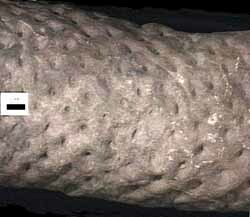 Leclercqia's stele was an exarch actinostele with scalariform and oval bordered pits on metaxylem tracheids. Sporangia were born on stalks on the adaxial surface of unmodified leaves, another derived character in this lineage. Sporangia were clustered in fertile zones alternating with vegetative leaves. Figure 5.6: Leclercqia microphyll. A sporangium was born adaxially on each fertile leaf; the sporangium rested on a sporangial pad, proximal to the ligule pit. 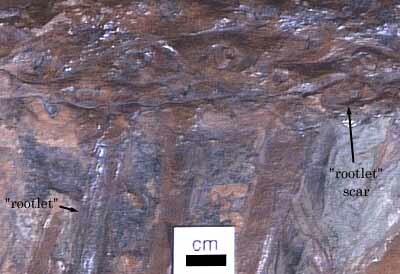 Because of the variety of preservation styles (e.g., coal ball permineralizations, compressions/impressions, casts/molds) in which they are recorded, we have an excellent picture of the arborescent lycopsids that dominated peat-forming and clastic swamps of the Carboniferous. These extensively-studied plants had to be painstakingly reconstructed from dispersed organs. Because of this, you will see a plethora of form generic names associated with each organism. In some cases, (particularly stems) single form genera seem to correspond to single organism genera. In other cases (e.g., foliage and microspores), several stem genera may be found in organic connection with a single genus of the organ. Initially, it may be difficult to "see the tree for the organs" but eventually you will be able to reconstruct the whole plant. Note: As luck would have it, most of the stem genera take nomenclatural priority (i.e., they were described first) so they can be used to describe the whole plant when it has been completely reconstructed. However, you should be careful to understand whether you are talking about Lepidodendron the stem genus, or Lepidodendron the tree. Why do you think it would be important to retain form generic names even when we understand how the whole plant should be reconstructed? 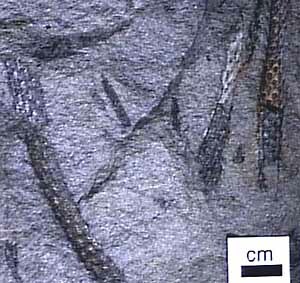 Tree Lycopsids: The Lepidodendrales or tree lycopsids (Figure 5.7) form a clade of Late Paleozoic diversity that most believe is sister to modern Isoetes. Arborescent lycopsids lived from the Late Devonian through the Permian, with a zenith and a major extinction in the Middle-Late Pennsylvanian. Arborescent lycopsids began life as an embryo germinating from an indehiscent megaspore. 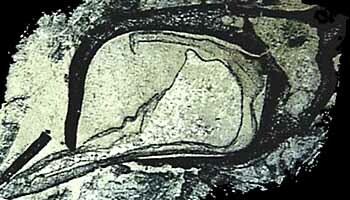 Early in life, the sporeling is characterized by a thick cortex surrounding a slender prostele (Figure 5.7b). This development probably gave the young plant a stump-like appearance. This pattern differs from tree-size seed plants, whose primary growth is mainly upward and girth expansion occurs over time by the accumulation of secondary xylem. As the arborescent lycopsid grew taller, the cortex thinned somewhat, a pith was added to form a siphonostele, and secondary growth from a unifacial vascular cambium was initiated. At some point in development, the apical meristem dichotomized and continued to do so at intervals. However, past the point of first branching, axes began to thin, the pith decreased in diameter, cortex thinned and growth terminated in slender branch tips vascularized by only a handful of tracheids arranged in a protostele. Commonly, the apical meristems differentiated into reproductive structures, making these plants monocarpic and determinant in their growth pattern. Ontogeny of a typical arborescent lycopsid (Lepidodendron). Note difference in leaves on immature and mature growth stages! Figure 5.7: Arborescent lycopsid (Lepidodendron). (A) Ontogeny of a typical arborescent lycopsid; (B) transverse sections of Lepidodendron trunk. What is the main source of support in this type of plant? This amazing interpretation was developed by D.A. Eggert (1961) who painstakingly reconstructed the development of Lepidodendron by serially sectioning many individuals preserved in coal balls. Through this detailed work, he recognized that the base and tips of arborescent lycopsids displayed a protostele, while mid portions had clear siphonosteles with large piths. This initial observation led to a reconstruction of the plant's developmental history, which, in turn, gave clues to its life history.